80% of the people in MENA prefer to break their fast at home. people prefer shopping in Hypermarkets that has a buy 1 get 1 offer. How does Ramadan affect grocery shopping and consumption? We all know, consumption of food increases during the holy month but how? and how much is the increase? Payfort had the answer in an interesting infographic. People tend to spend 50% more than usual on the lead up to Ramadan on groceries and food which comprise almost 22% of the monthly expenses. The purchase of dates, milk, yogurt and beverages especially increase by a margin of 50-75%. One of the notable grocery shopping trends is that people tend to do their Ramadan shopping more in Hypermarkets than local grocery stores and they the ones that has offers. The people were divided though regarding the type of offers they prefer, half the consumers stated they prefer a buy one get one free deal while the other half prefers straight up price discounts. 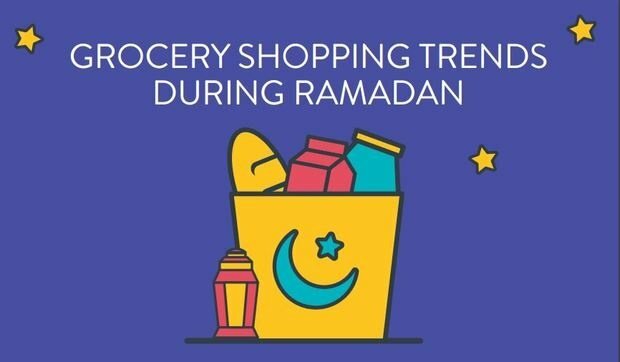 As for the Online grocery shopping, in some countries in MENA it can witness a spike of 100% in the days before Ramadan, then drop sharply by Eid. As for the consumption of food, 80% of the people in the Arab world prefer to break their fast at home while only 13% prefers to eat out. There's a small 7% that prefers eating at a family member's home.